This is a bit premature as I have yet to buy a GSXS. I want to keep the clean look of the bike but still carry some luggage. The Kriega range of tailpacks may fit my needs but I don't know if they will fit well to that small pillion seat. 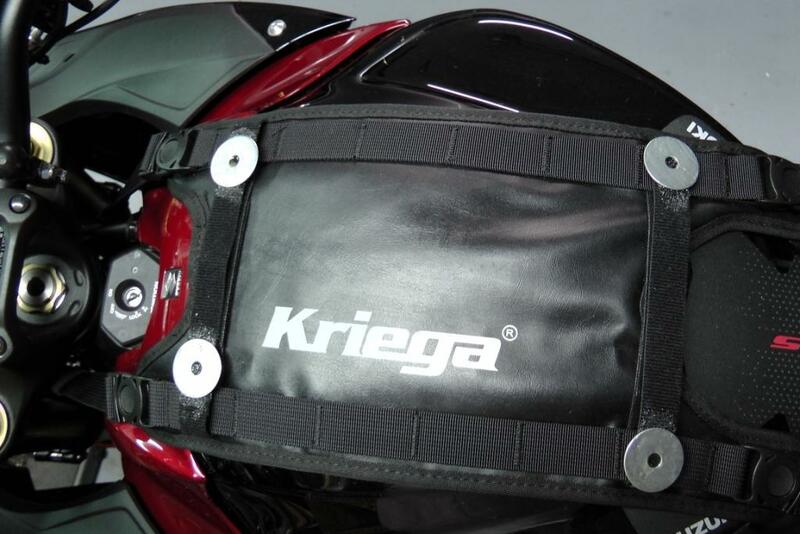 Has anyone fitted the Kriega US10 or US20 bags? My current and 2 previous bikes were fitted with the Ventura Rack system with the sport pack bag or 30L RJs bag. The Ventura is a excellent system but I don't want to fit this to the GSXS. 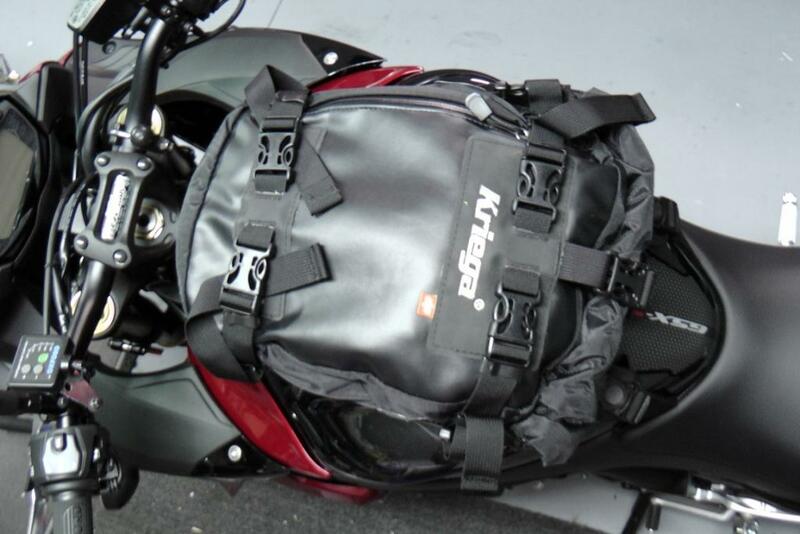 I have a Kriega R30 backpack and am very impressed by the quality and function on Kriega gear. One downside of the tailpacks is they aren't any easy open and drop stuff in bag; - but I have a tank bag for that. Other brands of tail bag have bunges to secure them - I hate the thought of bunges and other random straps on the bike. Yamaha YDS3 250 - 2 Stroke autolube, sound track 'yowler' - now a classic I should have kept. I've got a 20 and a 30 tail bag, just haven't looked at fitting them to the gsxs. If I get a chance after work, I'll have a look and see how they go. I usually tape up the painted sections around the pillion seat to stop any damage when the bag is rubbing on the paint. Duct tape first, as it doesnt leave horrible residue that's hard to remove. Then on top of that, I put some 100 mile and hour tape/ race tape/ gaffer tape/ whatever you want to call it haha. 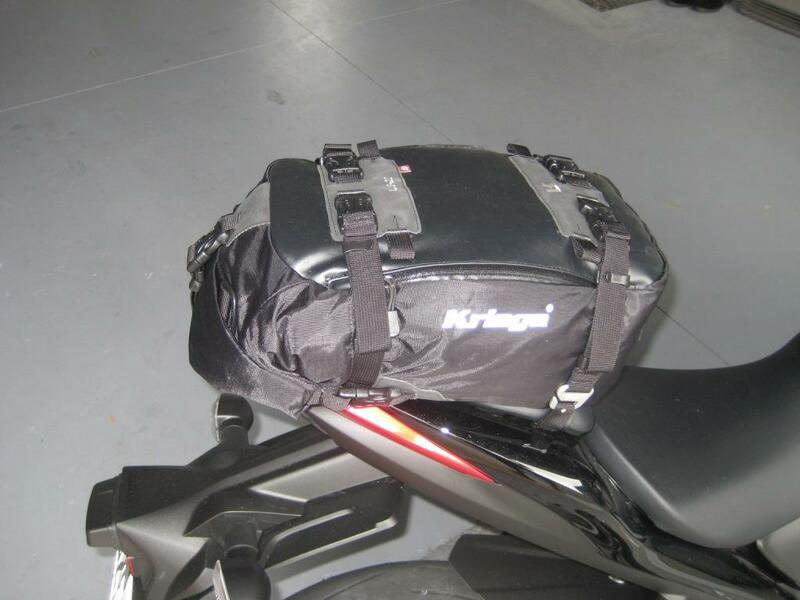 I have the Kriega tail packs, a 30l and three 20l bags. They are really excellent luggage bags and I can't see me ever using anything else. I'very only used it the once so far on the GSXS. No problems what so ever with getting it all attached. Underneath the pillion tail seat, part of the frame that runs up through there and you can attach the straps to it and then they sit out from under the seat. You attach the bags to the straps. Really simple and your luggage is secure. I thought the 30L may be too large/ wide to fit on the seat and that is why I was thinking of a 20L and 10L combo. What advice can you provide on the relative size of the 30L and 20L on the bike? There's no doubt the 30l does fill the whole of the pillion seat but it's not hanging over the sides. I personally think the 20l, 10l combo would be too small, especially the 10l bags, but I suppose it all depends how much you want to take with you and how long you'd be away for. I could maybe try and get a pic for you of the kit on my bike so you can see how it looks and get you the dimensions of the tailbacks too. I wouldn't use any other luggage now after having the Kriega and have had full pannier and top box systems before on other bikes. I like to get the weight a bit lower down and like the looks of the SWMotech Blaze soft bags. They are stable, look decent and come with waterproof inner bags that have kept everything dry for me so far - even through a downpour. They are bike specific and it's easy to throw a tail bag or use a net for quick access stuff (I use the ogio). Bike arrived and now fitted up. Kriega luggage is my choice for this bike. I have had Ventura pack frames on previous bikes but don't consider the frame a good choice for this sports bike. 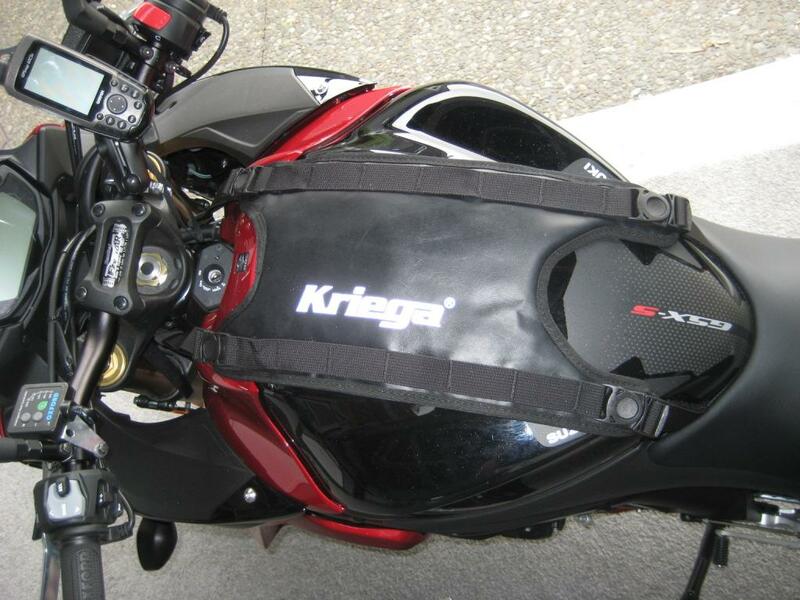 The Kriega gear is the US10, US20 and Tank. The Tank item should protect the petrol tank from scratches and provide a platform to fit an existing magnetic tank bag to as well as the US10. I used double sided Velcro tape with washers glued on as a means of connecting the magnetic tank bag to the Kriega Tank. 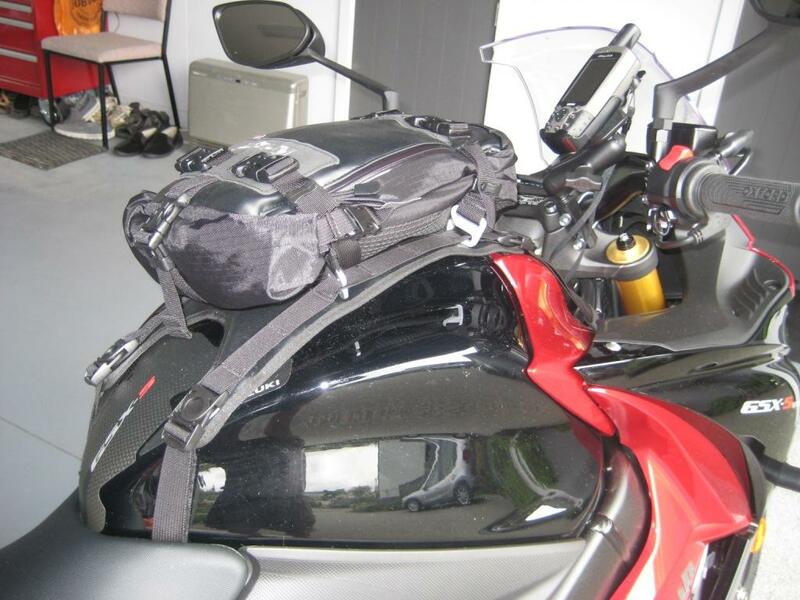 I may only use the magnetic bag when both the US10 and US20 are full and on the pillion set. 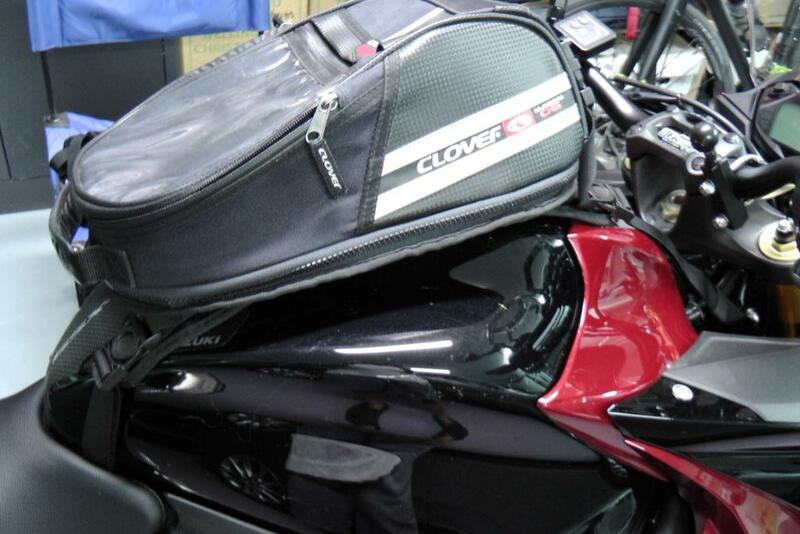 If I carry a pillion I have the choice of the US10 or magnetic bag on the Tank. Or buy another US10 . Touring light (in sports mode) - 30L of luggage is ample for a few days away. Whats the 20l bag like if its say only half full? is it all floppy and likely to rub on the bike? The straps compress the bag which would need to be quarter full or there abouts to be firm. The 20L bag will go inside the 10L and half fills it so there are more options. The bag could rub on the painted area behind the pillion seat and I have considered putting 3M protective film on there. The bag could rub on the painted area behind the pillion seat and I have considered putting 3M protective film on there. I had the tailpiece covered with 3M (matte to go with the grey paint) for the same reason with my Oxford throwovers. Works perfectly and covers the compound curves with no problem. I had mine done professionally.